Oprah and Co-CEO John MacKay discuss MacKay’s ongoing revolutionary approach to providing a healthy, organic food market alternative. There are a lot of great tidbits here, insights into his personal mantras that opened the possibilities for his astounding success with Whole Food’s Market. We may not be nor endeavour to be the CEO of a multi-million dollar company but MacKay’s perspective on running his billion dollar company offers wonderful insight whatever our job or career. After listening to this week’s SuperSoulSunday program, I feel the perspective is clearly more than ‘business acumen’, it is a mindful way to look for adventure, creativity and love in every aspect of your life. For this week`s soup recipe, I`ve decided to add some creativity with a touch of adventure. Potato soup is always delicious and comforting. Just as it is. 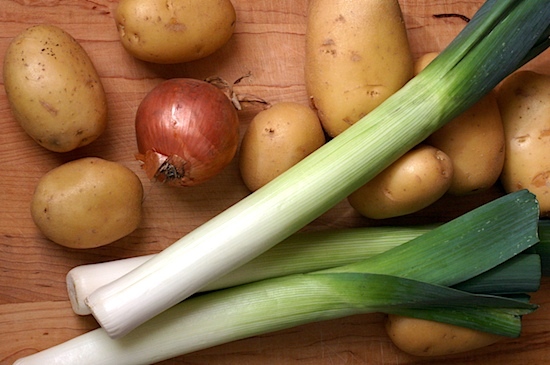 My recipe this week will add – wait for it – leeks! A little bit oniony, sweet, that ingredient that causes people to say `what am I tasting here – I know this flavour, just can`t place it….` It doesn`t take much to add a touch of creative adventure to our lives. If you aren`t sure where to begin, start with the soup. Time to kick it up a notch – ENJOY! 5. Simmer the vegetables in the pot until they are cooked through. Next post2014 Summer Reading List!